Lightweight concretes can either be lightweight aggregate concrete, foamed concrete or autoclaved aerated concrete (AAC). Lightweight concrete blocks are often used in house construction. Natural materials, like volcanic pumice. The thermal treatment of natural raw materials like clay, slate or shale i.e. Leca. Manufacture from industrial by-products such as fly ash, i.e. Lytag. Processing of industrial by-products such as pelletised expanded slab, i.e. Pellite. The required properties of the lightweight concrete will have a bearing on the best type of lightweight aggregate to use. If little structural requirement, but high thermal insulation properties, are needed then a light, weak aggregate can be used. This will result in relatively low strength concrete. Foamed concrete is a highly workable, low-density material which can incorporate up to 50 per cent entrained air. It is generally self-levelling, self-compacting and may be pumped. Foamed concrete is ideal for filling redundant voids such as disused fuel tanks, sewer systems, pipelines, and culverts - particularly where access is difficult. It is a recognised medium for the reinstatement of temporary road trenches. Good thermal insulation properties make foamed concrete also suitable for sub-screeds and filling under-floor voids. Lightweight aggregate concretes can be used for structural applications, with strengths equivalent to normal weight concrete. Reduction in dead loads making savings in foundations and reinforcement. Savings in transporting and handling precast units on site. Reduction in formwork and propping. The elastic modulus of lightweight concretes is lower than the equivalent strength normal weight concrete, but when considering the deflection of a slab or beam, this is counteracted by the reduced self-weight. The basic design for lightweight concrete is covered in Eurocode 2 Part 1-1, with section 11 having particular rules required for lightweight aggregate concretes. Concrete is considered to be lightweight is the density is not more than 2200kg/m3 (the density of normal weight concrete is assumed to be between 2300kg/m3 and 2400kg/m3) and a proportion of the aggregate should have a density of less than 2000kg/m3. Lightweight concrete can be specified using the notation LC for the strength class, e.g LC30/33, which denotes a lightweight concrete with a cylinder strength of 30MPa and a cube strength of 33MPa. The lighter the concrete, the greater are the differences to be accounted for in the properties of the concrete. The tensile strength, ultimate strains and shear strengths are all lower than a normal weight concrete with the same cylinder strength. Lightweight concretes are also less stiff than the equivalent normal strength concrete. However, this is mitigated by the reduction in self-weight to be carried, so the overall effect tends to be a slight reduction in the depth of a beam or slab. Creep and shrinkage for lightweight concretes are higher than that for the equivalent normal weight concrete, and this should be taken into account when designing the structure. Batching of lightweight concretes is normally done from ready-mixed concrete producers. At low workabilities, the concrete can easily be placed by skip or chute. Pumping lightweight concrete can be achieved, but care needs to be taken so that the concrete mix doesn’t separate. For pumpable mixes it is usual to use a natural sand, i.e. not to have a lightweight aggregate for the fine portion of the mix and to have a high workability so that increased pump friction and blockage is avoided. This is achieved with the use of admixtures. Over vibration of a lightweight concrete tends to cause segregation so a flowing concrete is best used when it is to be pumped as it requires only minimum vibration. 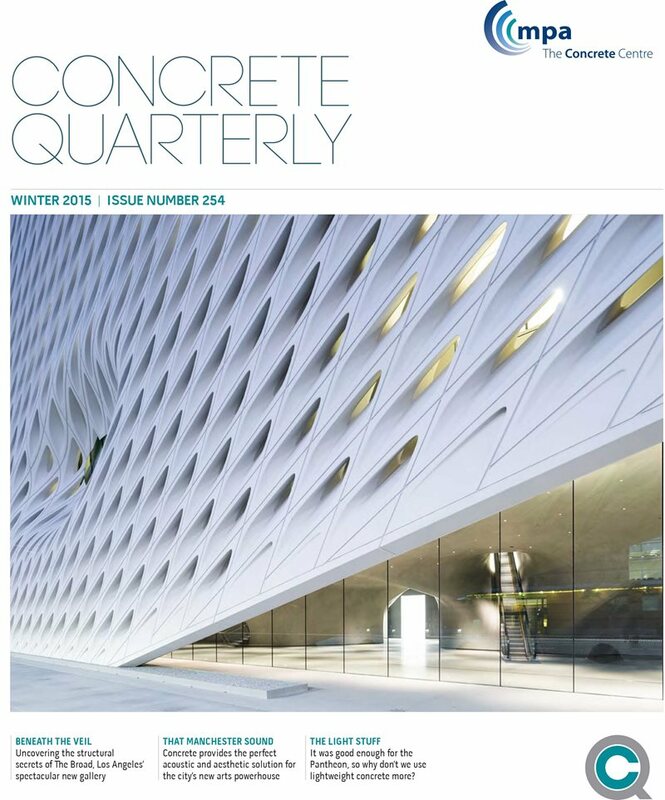 More information can be found in Concrete Quarterly Winter 2015. AAC was first commercially produced in 1923 in Sweden. Since then, AAC construction systems such as masonry units, reinforced floor/roof and wall panels and lintels have been used on all continents and every climatic condition. AAC can also be sawn by hand, sculpted and penetrated by nails, screws and fixings. Case studies and articles include: Structural and visual trickery at LA’s Broad museum; Manchester’s new cultural centre; London’s new social justice centre; In-situ concrete transforms a London home – from the floors to the dining table.